Dr. Cornes is registered with the BPS as a Chartered Psychologist and Fellow, with HCPC as a Counselling Psychologist, with UKCP as a member of the College of Family, Couple and Systemic Psychotherapy (via the Association for Family Therapy and Systemic Practice). Dr. Cornes holds a PhD in Psychological Medicine awarded by the University of Sydney, Discipline of Psychological Medicine, Faculty of Medicine, Australia and a Masters Degree in Social Science. 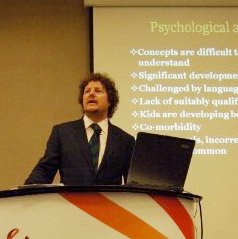 Dr. Cornes is an article reviewer for Bentham Publishing, the Australian and New Zealand Journal of Child and Adolescent Psychiatry and Australasian Psychiatry. In addition, Dr. Cornes is an External Assessor for the National Health and Medical Research Council (NHMRC) for the Australian Government. Dr. Cornes holds a current Enhanced Certificate issued by the Disclosure and Barring Service. Dr. Cornes holds professional indemnity insurance. Expert Witness assessments/opinion/testimony in Court Proceedings. Private therapeutic services for children, adolescents and adults with emotional, behavioural and psychological difficulties. Clinical supervision and bespoke psychological training. Specialist assessment, consultancy and Expert Witness assessments/reports/testimony on deaf and hearing-impaired children and adolescents. Consultancy and advice to SEN and Social Services Departments on working effectively and ethically with deaf children, adolescents and their parents/families. Offering therapeutic interventions to primary/secondary schools and alternative education providers to support pupils and teachers. This includes consultation and direct work with pupils who have emotional, behavioural and psychological difficulties.